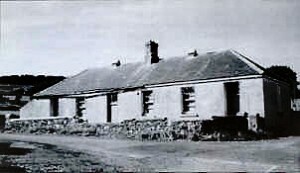 Ransboro National School or Scoil Réalt na Maidne was built in 1980-1981 as a six teacher school replacing Knocknarea four teacher school and Kilmacowen two teacher school. The name Ransboro, by which the general area is also known, is not on any map but owes its original to the era of the Penal Laws when the “Mass Rock” serving the area was located on the side of Knocknarea Mountain adjacent to the former and now demolished Knocknarea N.S. The mass rock site later was chosen for the erection of the local catholic church known as Ransboro church but originally spelled “Wrens Burrow”. The penal day’s mass rock was overlooked by a mass of rock in which there was a miniature cave, hole or burrow. Tradition has it, that always during the recital of mass a striking feature of the occasion was that the “Wren”, the king of the birds, was perched in that “burrow” hence the name “Wrens Burrow” now spelled Ransboro. The church built on the site of the Mass Rock still stands with its external appearance little changed and is now in private German ownership used as a residence. It was first purchased by the family of Eugene Lambert with a view to being developed as a theatre. The old church was in use up until 1964 when it was replaced by the beautiful church in the grounds immediately adjoining our school property which is officially known as the Star of the Sea Church. It is more commonly referred to as Ransboro Church in an area referred to by the older generation as “The Red Gate” from which the local news shop “Red Gate Stores” derives its name. It is very interesting to note that in 1972 when Knocknarea N.S was 99 years old, its last Principal was appointed. Only three principals have served there over the span of almost a century. In 1972 the total enrolment of Knocknarea was 23 pupils and the Department of Education vigorously opposed the appointment of a new principal and assistant on the grounds of their conviction that the continuance of either Knocknarea NS or Kilmacowen NS could not be justified any longer and plans had been finalised for the immediate closure of Knocknarea to coincide with the retirement of the principal Martin Timoney R.I.P. It was intended to transport the Knocknarea pupils to Strandhill NS and later to close Kilmacowen to coincide with the retirement of the then principal Jack Kilfeather R.I.P.and transport those pupils to Carraroe NS. 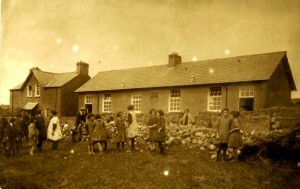 Interestingly, while Knocknarea was an affluent area in 1972 the school was still in a very dilapidated condition, having no water or flush toilets, a measure of the D.E.S determination to force the school closure. To further complicate matters the official Department of Education Rules in 1972 clearly stated that “a male principal could not be appointed to a school with a total enrolment of less than 36 pupils”. Notwithstanding the rule, the appointment of a male Principal went ahead. 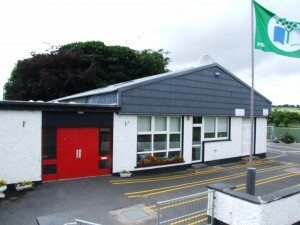 Kilmacowen NS was sold after its closure to the present owners, the GAA, where they also purchased adjoining land with a view to developing a playing pitch and converting the school to dressing rooms/conference room. With the development of the pitch at Ransboro, the GAA abandoned its plans for Kilmacowen NS which is being used as the local “playschool”, many of whose pupils join Ransboro NS. The present school, which originally consisted of six classrooms, a spacious hall/gym, a kitchen, staff room and library/medical room and two storerooms had in 1985 the library/medical room extended to create an extra classroom for a newly appointed seventh teacher. In 1988 because of a temporary drop in numbers we lost an assistant teacher but regained a replacement one year later. In summer of 1993 we were granted the part-time services of a learning support teacher, sharing with Scoil Asicus, Strandhill, the base school on a fifty-fifty basis. Our staff room then became the classroom for the learning support teacher. In January 2001 a substantial extension and refurbishment project was commenced at the school providing one new classroom replacing the 1985 extended classroom which was deemed to be substandard. A spacious learning support room was also provided as was a library/computer room. During the course of construction a resource teacher classroom, which was not provided for at the planning stage, was achieved by joining and extending two small existing storerooms. The abandoned substandard classroom was converted to provide a bright, spacious staff room which facilitates the observation of playground activity, a teachers servery, a specially adapted toilet for the disabled and the principals office. The former staff room is now the secretary’s office. In 2013 we opened two special classes for pupils with autism in temporary accommodation within the existing school building. In the same year, we embarked on a building project to provide a new mainstream classroom as well as the new autism unit. We moved into the new building in April 2016 and you can see images of the new building HERE.